This basil tea recipe is super easy and quick to make! And you can use either dried or chopped fresh leaves. When it comes to herbal drinks, my preference is for fresh every time! But if you've only got dried available, you still can get a tasty, healthy cuppa! A good idea if planning on making lots of drinks is to grow the herbs yourself. This way you will get a continuous supply of the freshest leaves for your tea and for your cooking needs. See the links on the left for growing pages. That's it! 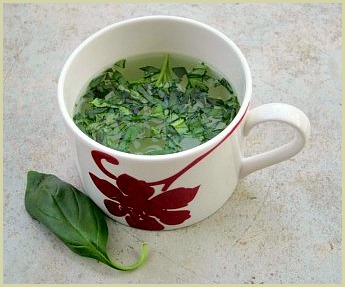 A refreshing healthy cup of basil tea in no time at all! ...Cinnamon, lemon, bush and the popular Thai variety to name a few that you could try. Incidentally, this is the most popular herb in the world used in numerous recipes and kitchens everywhere. But its versatility doesn't end at just cooking with it or making a cuppa, there are also many health benefits to be enjoyed. So this herbal tea is not only very quick, easy-to-make and extremely tasty, but also super healthy! More Herbal Tea Recipes You May Enjoy!